Population 13 million. Most residents live in cookie-cutter homes on the periphery, while money gets shuffled and counted in the towering crystal spires in its several business zones. Dozens of highways slice through the smog-filled metropolitan core, spewing auto traffic to malls and office parks. It is the death city, no-city, the every city, the city that the West built and that the rest of the world is scrambling to copy as quickly and cheaply as possible. I have seen its ashes in Gary, Indiana and I have seen its flames in Istanbul. With my work I seek to delve into the heart of Trashopolis and examine its car-filled veins. 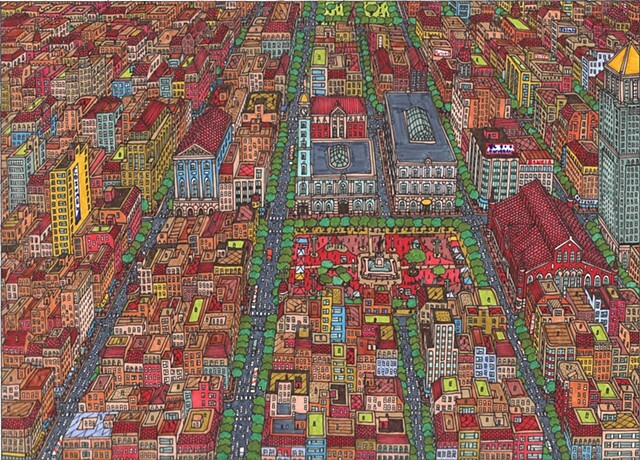 The art, factual, filled with loving detail, and drawn on the standardized office paper that jerks and scrolls from the endless printers of the business zone, points to the modern city and accuses, "this is what we have built." Its obsessive cataloging of the brute facts of the city, the slums next door to the power plant, provokes consideration of the grim world man has built for man. The irony of putting this work on display in the windowless concrete base of a 1960s urban renewal project reinforces the message that this trash may be our fate for some time. And, looking at the hundreds and hundreds of tiny windows, you must wonder: do bad cities make bad people? What kind of city fostered Michaelangelo and Leonardo? What kind of city trained Socrates and Plato? Are these cities anything like the ones we build today? The hundred dead windows do not answer, and you have your answer.